I am trying to upgrde to 12 but I keep going back to 11 because of so many things. So I am going to post some questions here and hopefully figure out how to make version 12 work for me. In Intellij 11 I could see the difference between folders that are checked into SVN and those that are not by color. I see no such differentiation in Intellj 12. How can I know if a directory is local or SVN managed? Folders that haven't been added to subversion are red in IntelliJ (using Darcula). Are they not red for you? I am not using Darcula. The folders are all brown and the file names are all black, except for files that are in SVN Add status, which are green. I found the settings for this under Editor>Colors & Fonts>File Status and it doesn't appear to be working. There is no difference between Unknown, Up to date and other statuses but the modified and Added status colors seem to be working fine. I haven't seen IntelliJ color a folder name unless a property on that folder itself has changed (e.g. the ignore property) or it needs to be added to subversion (in whic case it is red). Are you expecting the folder itself to be colored if it has files inside of it that has changed? 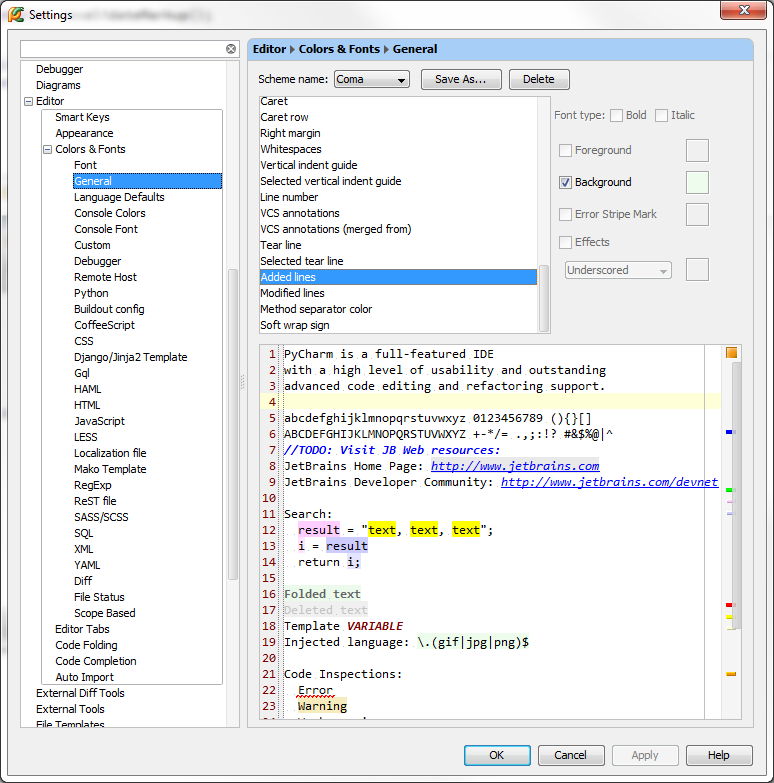 I expect any file or folder to be the color based on it's individual SVN status as defined in the Editor colors. So if a file with a status of "Unknown", it should be brown as it is defined in my settings. This is not working for files or folders. If a folder is not versioned by SVN, it should be brown. Does checking the option "Preferences->Project Settings->Version Control->Show directories with changed descendants" make it do what you want? actually seems like there are even more problems with the svn integration. Inside of a file that is versioned by SVN, it should shade in the left margin showing that there is a change. I should be able to select it and see what that change is. But that is all gone. The color of the file in this case changes but I can't see inside of the file where any of the changes are without doing an official diff. File | Settings | Editor | Color And Fons | File Status tab. You need to customize color for Modified. Folder color status is also controled here: customize Have changed descendants color. You can also customize file colors for scope in File | Settings | File Colors tab. Click Add new and choose Changed Files scope. Yes, all of these colors are defined but are not working. Have you tried invalidating your caches and restarting? It is a long-shot but might be worth a try. good idea but unfortunately did not change anything.